Kemençe is the common name for two very different instruments, one used in north Anatolian folk music, and the other in Turkish classical music. Names such as "pear-shaped kemençe" and "fasil kemençe" used until the mid-19th century eventually gave way to "classical kemençe." STRUCTURE: The classical kemençe is 40-41 centimeters in length and 14-15 centimeters wide. All its strings are of gut; only the yegâh string is silver-wound. Today some musicians use synthetic racquet strings, aluminum-wound gut or artificial silk strings, or chrome-wound steel violin strings. The sound post, which transmits the strings' vibration to the back of the instrument, is fixed between the bridge and back of the instrument under the neva string. A small hole, 3-4 mm in diameter, is drilled in the back of the instrument directly under the bridge. One can safely say that the kemençe is the most-adorned of the Turkish instruments. HISTORY: Until the 19th century, the Persian-derived word kemençe, meaning "small bow" or "small bowed instrument," was used for the spike fiddle known today as rebab. 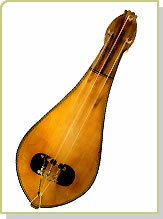 Also called kemân, the kemânçe was the only bowed instrument used in Turkish classical music until the late 18th century. The kemânçe gave way first to the viola d'amore and later to the European violin. The pear-shaped kemençe first entered the fasil ensemble in the mid-19th century. Before the pear-shaped kemençe entered the fasil ensemble, it was known by the Greek word lira (consequently the instrument, which has in recent years become very popular in Greece, is known as politiki lira, meaning "city lira," i.e. "Istanbul lira"). Tanburî Cemil Bey (1873-1916), who learned the instrument from Vasil and quickly became a virtuoso, transformed it into a sine qua non instrument of the fasil ensemble. In this way the kemençe, which was until a century ago played in meyhanes and taverns, had before the middle of the 20th century come to be considered, along with the tanbur and ney, one of the most "genuine" instruments of Turkish music. The fact that the kemençe's sound was much more suited to Turkish music, which in the beginning of the 20th century had taken on an extremely emotional and melancholy character, doubtless played a role in this. In the polyphonic Turkish music he devised, reformist Hüseyin Sadettin Arel (1880-1955) planned to give the central role to a five-member "kemençe family" he had designed in 1933. This was comprised of five different prototypes, soprano, alto, tenor, baritone and bass, each with four strings of equalized length. He composed pieces especially for this new family of instruments, but before long they were abandoned. Cüneyt Orhon, one of the instructors in the Istanbul State Turkish Music Conservatory which opened in 1976, preferred to teach Arel's soprano kemençe, which was tuned like the violin. Today, the traditional three-stringed kemençe and the four-stringed kemençe are taught separately in that institution.